David Herpich of Emerald Adrift returns triumphantly to Earth Mantra with a new album entitled Shifting Labyrinths, and we could not be more excited to present this exquisite and fascinating release to our audience. As one comes to expect from Emerald Adrift, the music recognizes no genre boundaries, effortlessly blending such diverse influences as dark ambience, experimentalism, chamber music, electronica, film music, and textural ambience, with hints of new age and space music imbued throughout. Like all of his work, the compositions are deep and supremely well-conceived; and like all of his performances, the delivery of those compositions simply delights. Those listeners familiar with contemporary classical music will recognize moments of homage, where David pays tribute to those composers who have influenced him. But as is also typical for his work, the music remains steadfastly approachable to listeners from all points of the compass, with something special for everyone to enjoy, whether one is an academic connoisseur, a listener who enjoys music that pushes the boundaries of the experimental, or just a fan of good music of any variety. Amazingly, the four pieces on this album were recorded during live radio broadcasts in 2009 and 2010. In each case, the music was improvised and performed in real time, without any pre-recorded elements or overdubs. Again, David has blown us away with his unparalleled ability to compose meaningful and enduring music on the fly, a talent at improvisation that we find difficult to comprehend. Indeed, the music of this album illustrates clearly David's astonishing gifts. This is the sort of music that one can listen to over and over, always hearing something new, always experiencing a new dimension or perspective that wasn't apparent before. Remarkable work. This is the sixth Emerald Adrift album released over the past several years on various netlabels, including three other titles here on Earth Mantra. 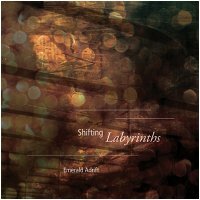 Of these, David reports that Shifting Labyrinths is probably the one most heavily influenced by his love of orchestral and chamber music from the mid-to-late twentieth century, adding: "I don't know what fans of ambient music will make of the result, but I do know that it is dear to my heart. I am therefore once again grateful to Earth Mantra for supporting and encouraging my work over the years, and for bringing these sometimes esoteric sounds to a wider audience." We are similarly grateful to David for the opportunity to offer his incomparable work to our listeners, and particularly for bringing Shifting Labyrinths to the shores of Earth Mantra. Certainly one of the most intriguing releases of 2011, and one that is highly, highly recommended. Special note: the download for this recording includes both MP3 and FLAC formats. Unlike MP3, which throws away some of the audio data in order to achieve high compression, FLAC is a lossless format that is identical in quality to the original audio signal. For more information about FLAC, please visit the FLAC home page. This ambient fan is very pleased with the result! I think the above paragraphs say it all. And he improvised it on the spot. With his melding of serious contemporary and ambient genres, what do his WRITTEN compositions sound like? Very interesting work. Keep on challenging our minds, David. Thank you and thanks to Earth Mantra.